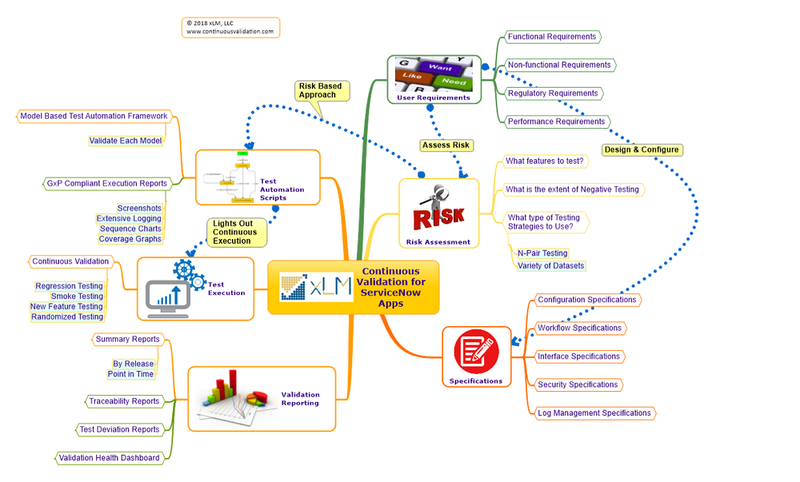 The above diagram depicts the key elements of a Continuous Validation Program for ServiceNow Apps (Note: ServiceNow IaaS/PaaS Qualification is not included here. The focus of this article is on App Validation). This step provides the foundation for the continuous validation framework. We clearly specify Functional, Non-functional, Regulatory, Performance, Security, Logging, Disaster Recovery, Interface requirements, etc. working with the Customer/End User. In our experience very rarely a logical, useful risk assessment is performed, let alone applying it to testing strategies. The output of our risk assessment is applied to our testing strategies to determine: What features to test? What should be the extent of negative testing? What type of testing strategies to utilize (for eg: datasets to use, N Pair Testing)? We specify Configuration, Workflow, Interface, Security, Log Management, etc.. specifications to meet your requirements defined earlier. We establish traceability between requirements and testing to ensure coverage. xLM leverages a Model Based Test Automation framework for developing various models to validate your ServiceNow apps. We use a data designer to generate test data including randomized data. We also use combinatorial testing strategies to reduce the number of iterations while increasing the test effectiveness. The test automation model is validated to ensure that it is meets the specified objectives. This validation effort is based on a model design that generates good execution reports. All our execution reports provide enough evidence so that it is, to a certain extent are self-validating. The model based test automation approach provides us with the flexibility to re-purpose the same model to conduct various types of tests (smoke, regression, greedy path, optimal path, load, performance, etc..). Also, such a framework lends itself more conducive to updates (remember your cloud app is constantly changing...so will your test automation framework!). Our framework is well suited for continuously running validation test scripts (say on a daily basis) - you can even randomize your smoke and regression tests continuously! A robust ALM (Application Lifecycle Management) tool forms the heart of our Continuous Validation Platform. Our goal is to remove paper and manual generation of reports (in short: Microsoft Word will not play any role here!). Our ALM tool provides real-time dashboards, KPIs, summary reports, test deviation reports and more. Your real-time Validation Health Dashboard becomes a reality. xLM platform is designed to accommodate high velocity of changes with built-in support for robust testing strategies. It incorporates modern technology and frameworks to ensure data integrity requirements are met as expected by the Regulatory Agencies. xLM is the right track for ServiceNow validation!